Jim Caroll during Plenary 2 at IRU World Congress at OCEC in Muscat, Oman, on November 7, 2018. I’ve been talking about IoT long before the phrase was defined – as early as 1993 looking back at my email archive! – using the phrase “hyper-connectivity.” I guess you can do a good job predicting the future even if you don’t get the exact phrase correct. In some of my early Internet books – around 1995 – I was writing about what would happen when every device that is a part of our daily life becomes connected, intelligent and aware. We are now in the early stages of that trend – almost 25 years later – and yet there is much more yet to come. Hyper-connectivity changes the very nature of a product; the value that it can bring; the role that it can play; and yet the most challenging reality is that it brings to the forefront massive new risk. Take a simple blood pressure cuff. Plug it in, connect it to the healthcare system, and you’ve got a pathway for the virtualization of healthcare. Take a street light, connect it, add some traffic flow monitoring technology to it, and you’ve got the basis of intelligent traffic management system. Every industry and every product is being impacted by the Internet of Things. Some know what to do with it; many do not. The latter includes those who are building smart products based on insecure, out of date Linux stacks – geeks will know what I mean – with the result that they add to the list of exponentiating computer security risk. The hyper connectivity trend speeds up the pace of change of every company to the speed of Silicon Valley. Every company is becoming a tech company, and that accelerates the pace of change! Many will fail because they can’t keep up! 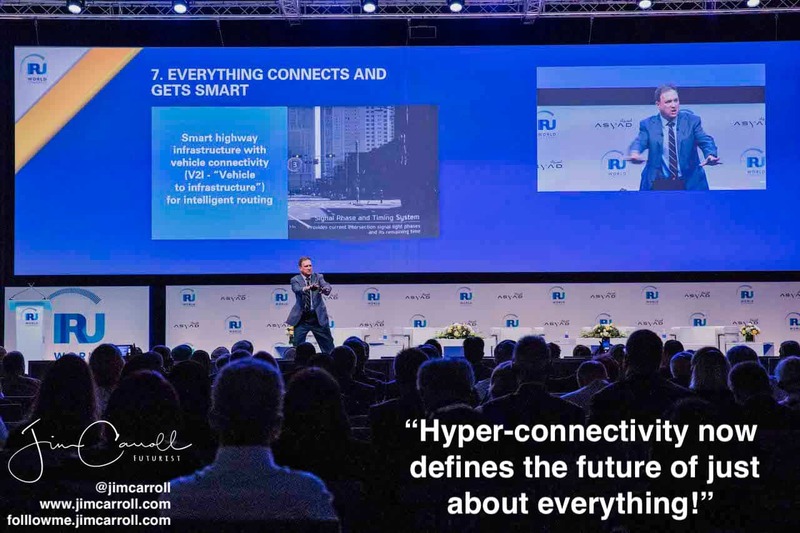 I spend a lot of time on stage talking about “hyper-connectivity,” and even have an entire speaking topic focused on it: “The Internet of Things – Disruption and Opportunity in an Era of Pervasive Connectivity” … and have delivered that keynote to a pretty long list of global organizations eager to understand the implications of this most important of all trends.